Few things are important enough to pull me away from my vacation time to post on Kotaku. 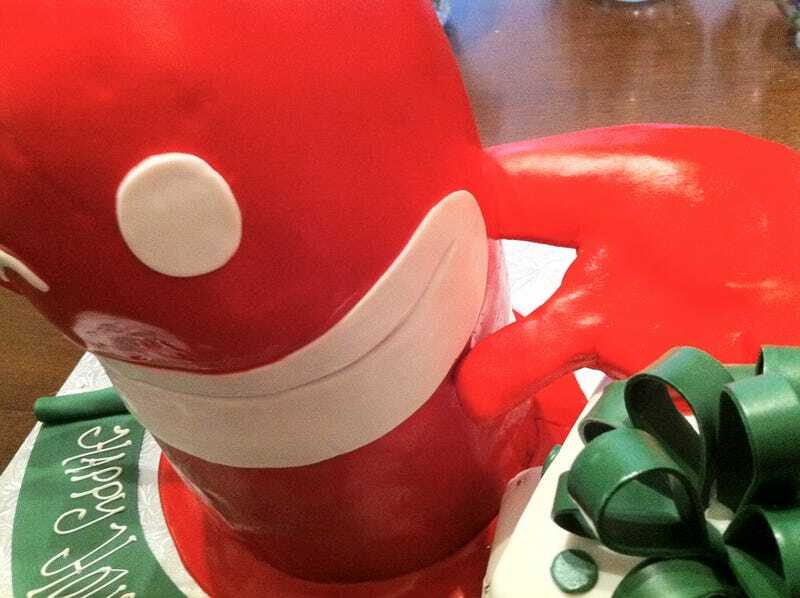 The one and a half foot tall De Blob cake that just arrived on my doorstep from THQ certainly qualifies. Since I began writing for Kotaku back in 2006 I've seen more than my fair share of video game cakes. Hell, I briefly had my own website called Gamecakes dedicated to the fine art of replicating digital characters and game consoles in baked form. The thing is, I've never had the opportunity to actually eat a video game cake. It's been a dream I've touched but never tasted. So when Mark Brickman from Baker's Man Inc. showed up at my door with this delicious-looking beastie, you can imagine my excitement. I wanted to hug the man, but I was holding cake, and those two things don't go together well. The gifts on the side are Rice Krispie treats covered in fondant. The cake itself is something with strawberry and fudge and vanilla cream. I wasn't paying very good attention at that point. All will become clear later tonight when I saw off De Blob's pretty little head and look inside. For now, remember De Blob as he is now, before I slice into him, tears welling in the corners of my eyes.